Friday March 13th 1891 It was a cold day. I was busy about the work all day. I wrote to Mother in the afternoon and helped Agnes iron. We hear Fanny is a little better today. Saturday March 14th 1891 I was very busy all forenoon with doing baking, churning, and sweeping. Will and I went to town in the sleigh in the afternoon and bought a new light buggy and surry and traded in our buggy. I spent a part of the afternoon out at Fannys. She is some better and I saw her today. I sent Lizzies fly net. Sunday March 15th 1891 I let Agnes go home for the day and I was busy with the work all the afternoon. I read all afternoon and wrote a little in the evening. weather warmer today. Monday March 16th 1891 We got an early start and got the washing done. The plants taken out and sprinkled and the house all cleaned up nice before dinner. Will took the buggy over to Lerners this morning and brought the surry home. He then went back and got the little road waggon. After dinner he took me over to Fannys. The roads are getting very bad. She is little better. Tuesday March 17th 1891 I fixed up the room up stairs for the new boarders who come in the afternoon. Mr. Holmes from Delavan came in the morning. I done a lot of baking today and cleaned up the north bed room and the parlor in the afternoon. weather mild and snow thawing rapidly. 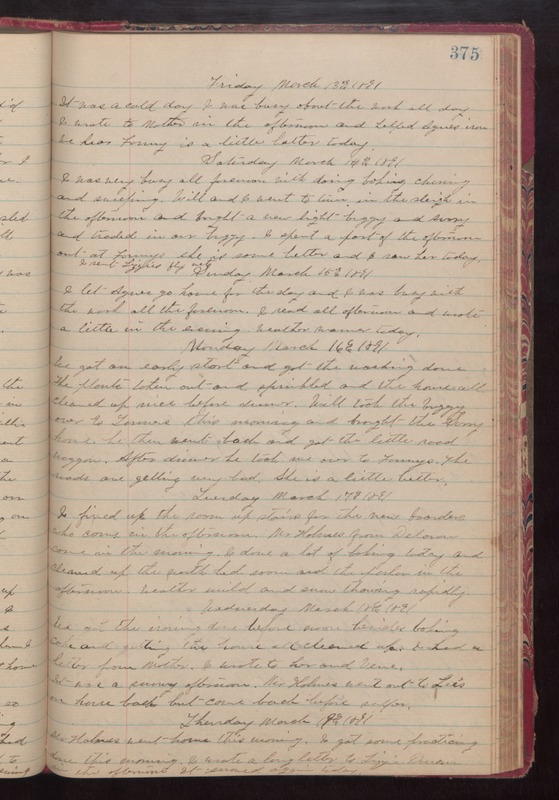 Wednesday March 18th 1891 We got the ironing done before noon besides baking cake and getting the house all cleaned up. I had a letter from Mother. I wrote to her and Vene. It was a sunny afternoon. Mr. Holmes went over to Lee's on horse back but came back before supper. Thursday March 19th 1891 Mr Holmes went home this morning. I got some practicing done this morning. I wrote a long letter to Lizzie Duncan in the afternoon. It snowed again today.